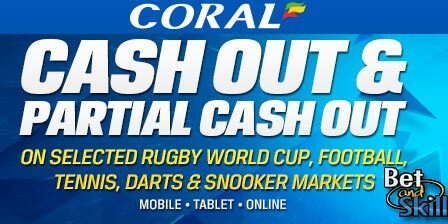 Online sportsbook Coral.co.uk has introduced a partial cash-out system within its sports betting product. Now Coral customers can close out a portion of their bet, while the rest of it will remain open. You can collect anything from 10% to 90% and the rest will stay on your original selection. Bet365 recently became the first gambling operator to introduce partial cash out while Betfair and Paddypower said they will introduce the facility later this year. The new service will enable Coral customers to cash out a portion of their active bet while leaving the remaining amount open. Punters can select the amount they would like to cash-out using a sliding scale, which will show cash-out values on the portion of the bet they want to trade. Customers will be able to adjust the slider to their chosen cash-out portion on an event, with the updated returns calculation is simultaneously presented on screen. Furthermore, you can use the cash-out and partial cash-out features on accumulator bets. For example, consider that you have placed a 7-fold acca over the weekend, the first six all win. Do you risk it all on the final match, or do you take your money and run? MY ACCOUNT > BET HISTORY > select CASHED OUT from the dropdown menu > enter DATE RANGE > DISPLAY RESULTS. Your Cashed Out bets will have an orange dot next to the date. "Coral launch Partial Cash-Out feature - How it works"
Exclusive Welcome Bonus + £20 on mobile!